This mesurement method for radiological diagnosis of atlantooccipital dislocation has been described by Powers et al (1979) based on direct roentgenograms. Powers ratio identifies anterior or posterior atlantooccipital subluxation. 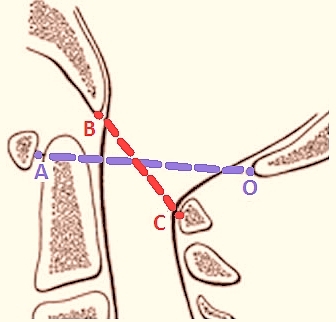 BC is the distance from the basion to the midvertical portion of posterior laminar line of the atlas. OA is distance from opisthion to midvertical portion of posterior surface of anterior arcus of the atlas. If this ratio is greater than 1, anterior subluxation exists. A ratio less than 0.55 is diagnostic of posterior translation. Powers ratio may not be sensible to vertical atlantooccipital dislocation. In these cases, Lee's X-Line may be preferable. Powers B, Miller MD, Kramer RS, Martinez S, Gehweiler JA., Jr Traumatic anterior atlanto-occipital dislocation. Neurosurgery. 1979;4:12–7.